Mom, What's For Dinner? : Mashed potato hollandaise "eggs"
Today's post is not a diet dish. I have been so good following my post cancer diet rules, the weight is dropping. Today is my high calorie day. I have to have 1 high calorie day each week to keep my metabolism moving. Yes I still used organic potatoes, asparagus, and eggs. Even grass fed pork bacon. BUT, I indulged in this high fat, major comfort food combo for a meal of bliss. I am back on my healthy light diet and can't wait for my next high calorie day! We love hollandaise in this house. I have missed it so much! 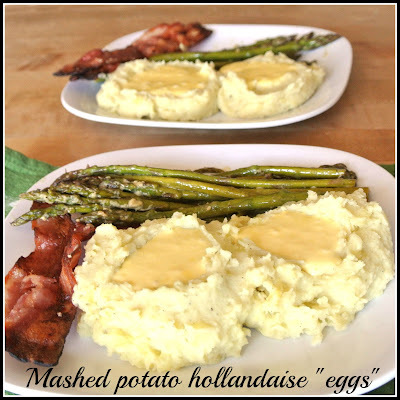 So I decided instead of eggs, I would make my favorite mashed potatoes and use hollandaise to make them playfully look like eggs. The Asparagus went nicely with the sauce too. All I have to say is, if you are ever looking for an indulgent comfort food. This one is it. 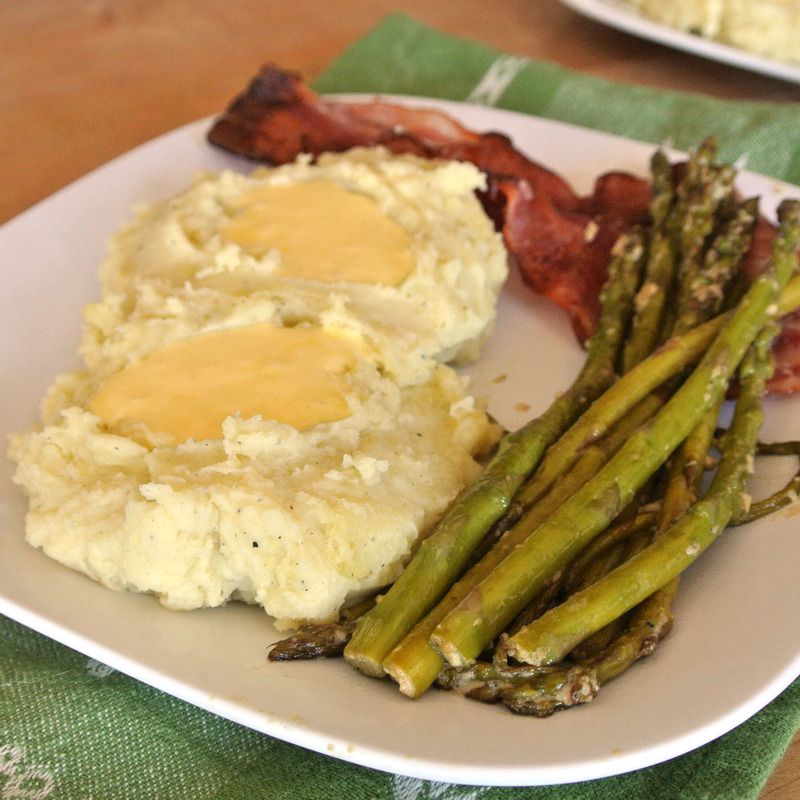 What do you need to make mashed potato hollandaise "eggs"? Start with my recipe for Garlic Parmesan Mashed Potatoes. Make your bacon either by pan frying it, or baking it in the oven. Your choice. I make my asparagus in a skillet with 1 tablespoon olive oil, 1 tablespoon butter, 1 tablespoon dijon mustard, and 1 tablespoon minced garlic. Add your trimmed asparagus and cook until aldente.